The microscope is one of the most important tools of the microbiologist. It was invented in the 1600s when Anton van Leeuwenhoek built on a simple model of a tube, magnifying lens, and stage to make the first visual discoveries of bacteria and circulating blood cells. Nowadays, microscopy is essential in the medical field to make new cellular discoveries, and the types of microscopes can be classified based on the physical principles they use to generate an image. Some of the most common scopes found in labs use visible projected light to illuminate and magnify an object. The most basic light scope, a dissecting or stereomicroscope, allows viewing of a whole organism at once while showing details like the antennae of a butterfly at 100x to 150x magnification. Compound scopes, used for greater cellular detail, contain two types of lenses that function to magnify unicellular organisms 1000 to 1500 times. More specialized are dark field and phase contrast microscopes, which scatter light to capture not only live cells, but even internal cell parts, like mitochondria. The fluorescent or confocal microscope uses ultraviolet light as its light source. When ultraviolet light hits an object it excites the electrons of the object, emitting light in various colors, which can help identify bacteria inside an organism. Unlike compound and dissecting scopes, fluorescent microscopes show the object through a confocal pinhole, so a complete image of the sample is not shown. This increases resolution by shutting out external fluorescent light and building a clean three-dimensional image of the sample. The energy source used in the electron microscope is a beam of electrons. The beam has an exceptionally short wavelength, and increases the resolution of the image significantly over light microscopy. Whole objects are coated in gold or palladium, which deflects the electron beam, creating dark and light areas as 3-D images viewed on a monitor. Details like the intricate silica shells of marine diatoms and surface details of viruses can be captured. Both transmission electron microscopes (TEM) and the newer scanning electron microscopes (SEM) fall in this specialized category of microscopy. As the name suggests, these microscopes use a beam of X-rays to create an image. Unlike visible light, X-rays do not reflect or refract easily, and they are invisible to the human eye. The image resolution of an X-ray microscope falls between that of an optical microscope and that of an electron microscope, and is sensitive enough to determine the individual placement of atoms within molecules of a crystal. In contrast to electron microscopy, wherein the object is dried and fixed, these highly specialized microscopes are capable of showing living cells. Wiedenhoft, Heather. 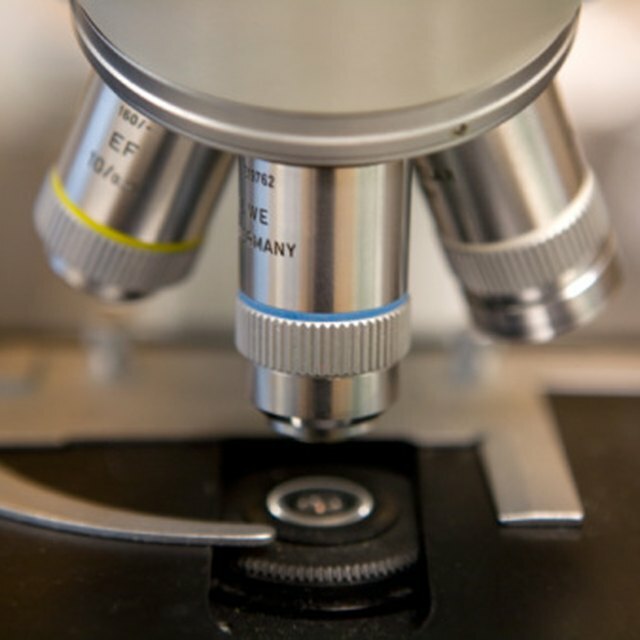 "What Are the Different Types of Microscopy Used in a Microbiology Laboratory?" Sciencing, https://sciencing.com/different-types-microscopy-used-microbiology-laboratory-16179.html. 10 March 2018.